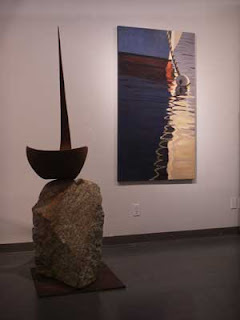 Each time I visit my listing, Inn on the Harbor, I visit the Isalos Gallery. I remember walking into the gallery and immediately being drawn to a large vertical photo on a back wall (pictured here). The artist is Rebecca Daugherty. Her use of perspective in some of her pieces is what I love to do with my photographs. And her play on light is stunning. This piece stuck with me, period. So I am glad I found her blog and website and can keep up with her work. Stop by Isalos if you're in the area (I can show you a fabulous inn for sale, too!) or at one of the locations where her work is on display.